Question: Hi,I have four poweroutlets in my living room. One outlet has some issues that I am unable to resolve. 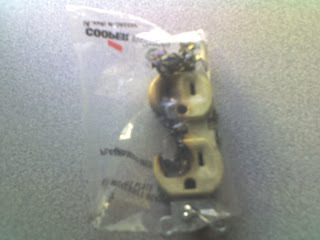 I have to have some thing pluged-in in one of the outlets at all times in order for other three outlets to work. If I take out the plug from the outlet which is malfunctioning, the rest of the three loses power and every thing pluged-in in these three outlets stops. Soem times I have to insert the plug in and out several times in the malfunctioning powerout let to get the power back int he rest of the three outlets.Please let me know what needs to be fixed." Philadelphia area which has many houses that still have Knob and Tube wiring. I was in a home in the Manayunk section (19127) that had the same problem and found a broken return in the neutral. I also found signs of arching in the box that could have started a fire. It was an easy fix but not one to be taken lightly.